To introduce the Dunning-Kruger effect, here is John Cleese (of Monty Python fame). I was reminded of the Dunning-Kruger effect by Daily Kos contributor “Shockwave” who reported on Trump’s base mindset/cult and the Dunning-Kruger effect. The effect can be visualized in this simple graph. you think you know more than you do. Bear in mind as you read on that the effect afflicts us all. Why? Because we are all not experts in everything. In those domains in which we are not experts, we will tend to overestimate our expertise. Writing in The Cut Jessica Pressler names Donald Trump, the Dunning-Kruger President. Of course, as the results of the election revealed, Trump supporters weren’t the only ones “suffering from Dunning-Kruger,” as goes the social-media j’accuse. As it turns out, we were all the deluded simpletons. Dunning has more to say about the research on the Dunning-Kruger effect especially as it applies to Trump and his supporters. Back in 2016, before the election, David Dunning wrote about The Psychological Quirk That Explains Why You Love Donald Trump. 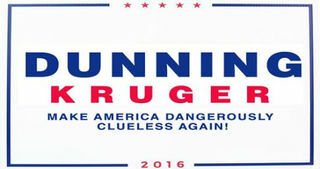 The popularity of the GOP front-runner can be explained by the Dunning-Kruger Effect. Here are quick takes on the supporting research. 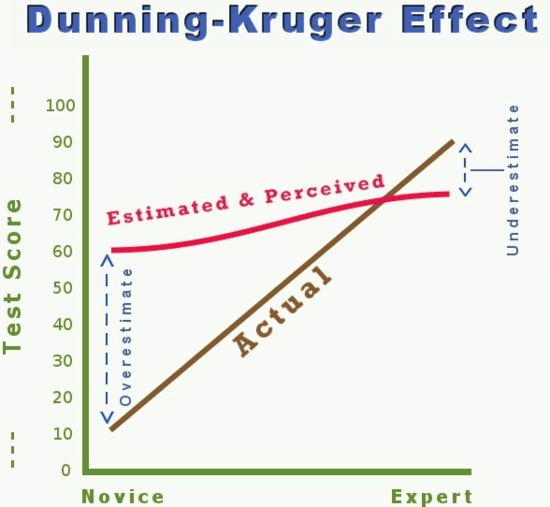 … the key to the Dunning-Kruger Effect is not that unknowledgeable voters are uninformed; it is that they are often misinformed—their heads filled with false data, facts and theories that can lead to misguided conclusions held with tenacious confidence and extreme partisanship, perhaps some that make them nod in agreement with Trump at his rallies. On top of all that, Shockwave cited the alternet.org story A Neuroscientist Explains How Trump Supporters Are Easily Hoodwinked Because of This One Psychological Problem (Bobby Azarian/Raw Story). Those who score low on political knowledge tend to overestimate their expertise even more when greater emphasis is placed on political affiliation. So the effect is really engaged when it comes to politics. The lead photo in Part 1 of this series led me to wonder if children who attend Trump’s rallies were learning to be overly confident in what they think they know. Might they be in a perpetual environment of “false data, facts and theories”? Unfortunately, after a few hours on Google Scholar (and other searches), I could not get a fix on a body of research that might confirm (or disconfirm) my suspicion. If you know of relevant research, please let me know (at wsmaki@gmail.com). So, anyway, here is my conjecture. Instead of “voters” in that passage, substitute “Trump voters’ children.” To be sure watching children ape their parents shouting “lock her up” with heretofore unimaginable vehemence is horrifying, but think about what else these kids might be learning that will dispose them during their lifetimes to the Dunning-Kruger effect. Filling their heads with “false data, facts and theories” might render them especially unable to accurately evaluate what misinformation is fed to them and thus leave them believing that they know more than they do.